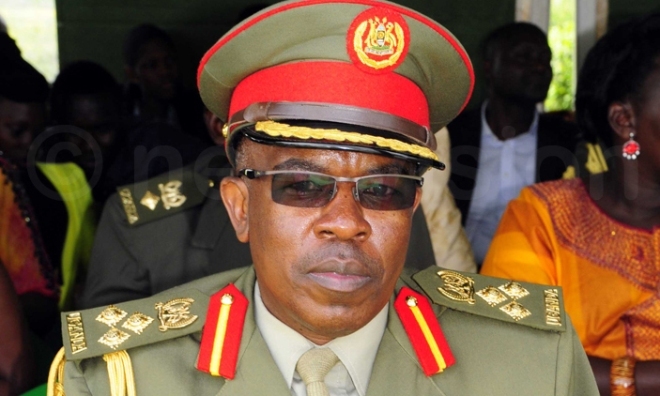 MAKINDYE -Top military officers on Thursday interrogated five jailed police officers, who were Gen Kale Kayihura’s blue-eyed boys, in connection with several offences connected to kidnap, espionage, reason and illegal expatriation of refugees, PML Daily has learnt. The officers, who were arrested by the Chieftaincy of Military Intelligence (CMI) in an operation that started on Tuesday, include former Gen Kayihura’s personal assistant Jonathan Baroza, former cybercrime boss Richard Ndaboine, former Flying Squad Commander Herbert Muhangi, former director of Crime Intelligence Col Ndawula Atwooki and former Kampala South regional police commander ACP Siraje Bakaleke. They were all formerly close allies of former Inspector General of Police Gen Kale Kayihura, who is also under arrest. Highly placed sources close to the matter said the interrogation took place at Makindye Military Barracks. The interrogation panel is said to have comprised Chief of Defence Forces (CDF), Gen David Muhoozi, the Security minister, Gen Elly Tumwine, CMI commander Brig Abel Kandiho, director of Internal Security Organisation (ISO), Frank Kaka Bagyenda, Director for Counterterrorism Abbas Byakagaba and CID Director Grace Akullo. It is not clear whether the interrogation ended or will continue at a later time. Army spokesperson Brig Richard Karemire said the charges would be revealed at an appropriate time and refused to reveal further details. This comes after the UPDF confirmed that former the Inspector General of Police, Gen Kale Kayihura, is being questioned over several issues at Makindye Military Barracks. “Reference to yesterday’s Press Statement regarding Gen Kale Kayihura and this is to update as follows: the General was indeed flown to Kampala from his farm in Kashagama – Lyantonde District and is being questioned on a matter the details of which cannot at this point be divulged,” a statement issued by the army spokesperson, Brig Richard Karemire, on Thursday evening reads in part. UPDF spokesperson Brig. Richard Karemire. “We will keep you informed about any other developments regarding the matter,” he added. Brig Karemire also said Gen Kayihura had access to his lawyers and family members. However, there are reports that his arrest is connected to the murder of former police spokesperson Andrew Felix Kaweesi.